The only show on this list that’s currently in production, PhoneShop is an ensemble sitcom following the workers at a branch of PhoneShop on a high street in south London. It initially focuses on the arrival of a new staff member, the wet-behind-the-ears Christopher, a graduate who clearly didn’t expect to be working retail. PhoneShop has had two series so far on E4, with subsequent HD broadcasts on C4, having started life in 2009 as one of Channel 4’s Comedy Showcase pilots. A third series is currently being broadcast. PhoneShop can’t be accused of being the most original sitcom in the world: a workplace mockumentary* with a strong vein of embarrassment humour, it clearly traces at least some of its lineage back to The Office – not coincidentally, as Ricky Gervais script-edited the pilot, broadcast in 2009. There is more to PhoneShop than that, however: the characters and humour quickly became more stylised than in The Office. Large though they may be, the characters are developed enough to give rise to a lot of the humour, with much of the rest coming from a (perhaps slightly unkind) satire on the modern high street and consumer. Ultimately the shop’s staff, despite the brutal environment they inhabit, form a bit of a family among themselves, and the second series shows somewhat more warmth between them. PhoneShop was created, produced and written by Phil Bowker, whose other credits include Pulling, with additional material coming from the excellent cast and associate producer Jon Macqueen. The faux patois banter between salesmen Ashley and Jerwayne (Andrew Brooke and Javone Prince) is always a highlight of an episode. As with several other shows on this list, the music is particularly effective, with unpleasant, jarring bursts of dance and electro turning the high street into a hostile and frightening place to visit. I can’t help but think PhoneShop isn’t so much underrated as a bit under-promoted, at least until recently. The production of a second series had passed me by until I came to research this blog, and Channel 4 is arguably not in one of its stronger patches for comedy, with panel shows dominating over sitcoms, and even those mainly older formats running slightly on fumes. Nonetheless PhoneShop is a success that finally seems to be getting recognised, with the current new series having been rather more heavily promoted. 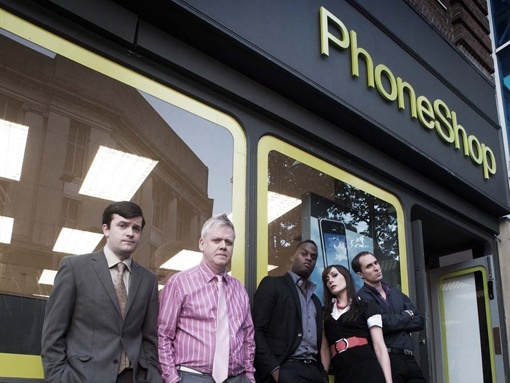 PhoneShop is available on 4OD , and its first series is on DVD. And of course, you can watch the current series on E4 on Thursdays at 10pm.